Prime Time Rewind TV is a new video site that promises to make it easy to find and watch the primetime network television shows online. “We would like to put you one-click away from watching your show,” claims the site. If that’s their goal, you have to wonder: Why do they present your viewing options on the faces of a rotating cube built in Flash? Yep – Prime Time Rewind TV takes you on a hyperlinked virtual reality journey into cyberspace, the likes we haven’t seen since around 1998. Use your mouse to rotate a virtual cube to choose a network. Then click on the show that you want to watch! There’s no way to know what side of the cube ABC or any other network is on. Is it on the back of the cube? Or is it on the bottom? #@#$! Just give me ABC! Each face of the cube only displays 16 shows. Aren’t there 21 hours of prime time? (8-11, 7 days a week) Were do the rest of the shows go? The cube has ten sides! Rotate it left to right, and you’ll see six sides for six networks: ABC, NBC, CBS, Fox, USA, and TNT. Rotate it up and down, though, and you get four category sides: Reality, Comedy, Drama and Action. Aren’t cubes supposed to have six sides? Normally, you’d have to use a pentagonal trapezohedron to get an object with 10 faces. Prime Time Rewind put 10 sides on a cube through the magic of cyberspace! Many of the show names don’t fit in the space allowed on the cube. Check out the screen capture, above, and you’ll find these shows: Late Night C, Lipstick Jun, My Name is E & Victoria Bec. 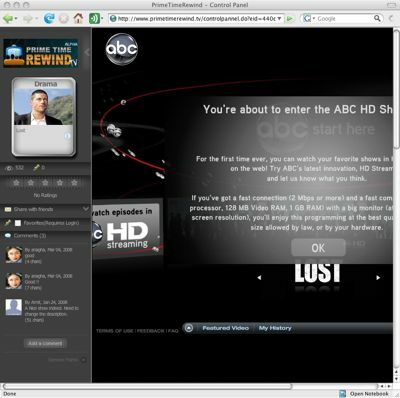 Now – let’s say that you figure out which side of the cube ABC is on and you click on the icon for Lost. What do you get? You know what that means – your user experience is different for every network. 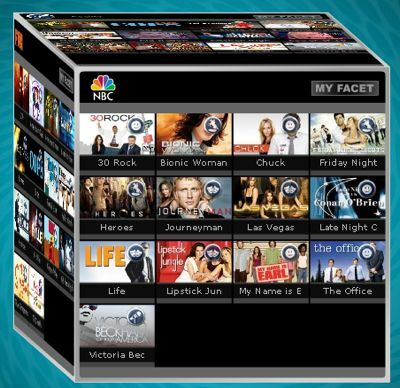 You can get an account on Prime Time Rewind TV and set up your own custom “facet” on the cube, but there’s really no reason that you’d want to. Prime Time Rewind TV is a stinking mess. It collects everything that wrong with the current state of Internet television and adds a layer of garbage over the top. There’s nothing to redeem this site. The site is currently in alpha. It should not go to beta. It should go back to the drawing board, to avoid wasting any more effort on this ill-conceived venture. The site looks like a damn Rubik’s cube. Call Michel Gondry to figure it out. I hadn’t noticed “Desperate Ho”! That’s pretty funny. One of the risks of opening up to the public a service when it is still in ALPHA stage, is that one risks getting reviews like this one. We deliberated whether we should be building the service in stealth mode and open it in ‘invitation only’ mod, but decided against it and are building it completely open to public commentary. – The cube has 10 sides – actually it has a much larger number of facets. the more networks make their shows available for online viewing – the more facets. The cube is just a menu vehicle. some may like it, and some may not. We appreciate any comments/suggestions for improvement. Great and reasoned feedback. It sounds like you plan on taking our criticism and the criticism that others have offered to heart and use it constructively.